Leh, Ladakh, J&K, India – When His Holiness the Dalai Lama arrived on the stage of the Shiwatsel teaching pavilion this morning, students from the Tibetan Children’s Village School were challenging students from Ladakh Public School in debate. 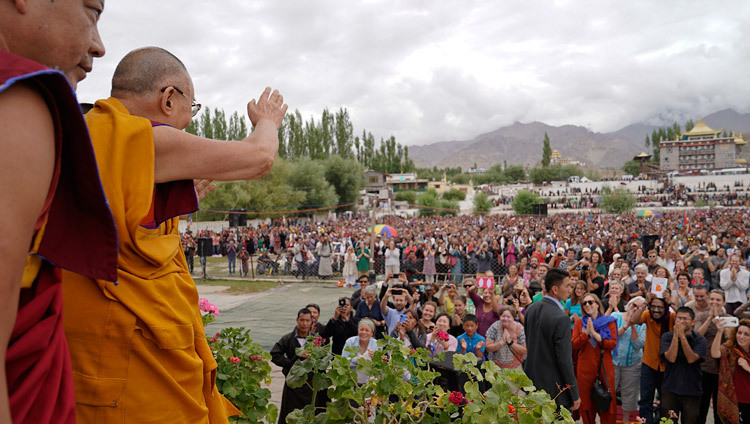 He waved to the audience, Westerners on the left, Chinese speakers on the right, Ladakhis and Tibetans, red-robed monastics in the front, filling the rest of the ground. “We face countless problems. Day by day people bring their suffering and problems to me. All of them arise as a result of our relation to our psycho-physical aggregates, our combination of body and mind. In discussing whether our problems could be overcome, the Buddha asked whether suffering was part of our intrinsic nature. If it were, we would be unable to overcome it. In stating that suffering is distinct from the nature of the mind, he declared that it can be overcome. We can achieve true cessation. “The first ‘gateh’ of the ‘Heart Sutra’ mantra indicates the first of the five paths—the path of accumulation. In the context of the general path this occurs when you generate a firm determination to be free from suffering. In terms of the Great Vehicle, you reach the path of accumulation when you generate a firm aspiration to attain enlightenment. “In his ‘Precious Garland’ Nagarjuna writes about attaining high status, which refers to good rebirth, and definite goodness, which refers firstly to freedom from destructive emotions and secondly to freedom from even their imprints. In terms of the ‘Guide to the Bodhisattva’s Way of Life’ the final goal of definite goodness is full enlightenment, the omniscient state of a Buddha. Nagarjuna further says that to achieve unsurpassable enlightenment for self and others we need compassion, the root of the awakening mind of bodhichitta, and an understanding of emptiness. 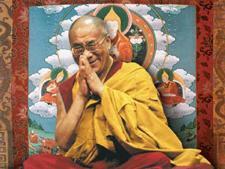 He adds—the focus of wisdom is enlightenment and the focus of compassion is sentient beings. His Holiness reminded everyone that since he finished reading Chapter 4 of the ‘Guide’ yesterday, today he would begin to read Chapter 5. It opens with apt advice, ‘Those who wish to guard their practice Should very attentively guard their minds’. Where verse 17 refers to the ‘secret of the mind’, His Holiness observed that it had to do with meditating on the emptiness of the mind itself. He said that it is very powerful for the mind to focus on its own true nature. He reported the traditional account of the origin of this work, explaining that there was a tradition in Nalanda for each monk to lead one of the bimonthly confession and purification ceremonies and to offer the community an edifying teaching. In the eyes of his fellow monks, Shantideva was undistinguished and they expected to be amused as he made a fool of himself. When he asked if he should recite something fresh or something that had been taught before, they requested something fresh. The result, dazzling to his peers, was this ‘Guide to the Bodhisattva’s Way of Life’. Shantideva also composed a ‘Compendium of Trainings’, which complements this work, and which he told them they would find in the rafters of his room. The two texts feature among the Six Texts of the Kadampas. As he continued to read, His Holiness drew attention to the importance, when you rely on a teacher, of his or her being fully qualified; an upholder of the Three Trainings. He also repeated that when meditating on the nature of the mind it is necessary to focus on its clarity and awareness. His Holiness alluded to trends in the developed world to seek pleasure in music and movies, good food and fashionable clothes, all of which amount to a level of sensual gratification that even animals are capable of. What sets human beings apart is their unique intelligence and an ability to find happiness on the basis of peace of mind. He suggested that deep mental satisfaction obviates a need for sensory fulfilment. He recalled a Catholic monk he met at Montserrat in Spain who had lived for five years as a hermit in a cave in the hills, surviving only on bread and tea. His Holiness asked about his practice and when the monk told him he had been meditating on love, he noticed a tell-tale sparkle in his eyes. Where the text recommends reading the sutras, His Holiness reminded the audience of the 100 volume Kangyur and more than 200 volume Tengyur collections. He summarized Buddhist conduct as non-violence and the Buddhist view as dependent arising. Beginning to read Chapter 6 on Patience, His Holiness identified three aspects: the patience of restraint when someone is harming you, patience in the face of trouble and the patience of gaining insight into the reality of things. He observed that patience is also important in relation the instruction for generating bodhichitta through exchanging self and others in Chapter 8. Concluding his reading for the day, His Holiness promised to continue tomorrow, when he also plans to give a White Tara Long-Life Empowerment.